Shankar Lal Shroff loves shirts. He is picky, fussy and hard to please. For this textile merchant based out of Mumbai, none of the brands available in India are good enough. Even as a young man he was a discerning customer, buying his shirts abroad, mostly bespoke. Finally, Shroff, along with his son Sanjiv, decided to start a boutique factory in India which would retail exquisitely-tailored premium shirts and also offer bespoke services in India and abroad. Their vision: `to create the best shirt-making facility in the world.’ Thus, Camessi was born in 2006. The Shroffs have been textile manufacturers for over 50 years. They own Reliance Chemotex Industries Limited and Spell Fashions, and have their textile mills on the fringes of Udaipur in Rajasthan. But a boutique shirt offering is a completely different ball game. As they were primarily consumers and had no prior experience in shirt making, two years were spent on R & D.
The fully air-conditioned factory began by employing female relatives of the workers who worked at their textile mills. While the men were reluctant at first, the Shroffs’ reputation and goodwill made them change their minds. Even today, only women are employed in the manufacturing processes of the factory. They go through a year-long training programme before they begin work. Camessi sources the best quality natural fabrics in cottons, silks and blends from Italy and Switzerland, while fabrics from Indian mills set up with Italian collaborations are used for the lower end ready-to-wear lines. Imported, core-spun sewing thread is used, that blends perfectly with the fabric. The shirts are hand cut and sewn using the latest German sewing technology. The Shroffs say that their shirts provide the kind of features that you see only in custom-made shirts by the world’s most expensive brands: patterns are matched from shoulder to sleeve, single-needle tailoring that ensures that the side seam is almost not visible, etc. Camessi has 23 stitches per inch (even the better known Italian luxury shirts have only 18 to 19, according to Shroff) and narrow 3 mm hemline with French seams lends a distinguished and elegant finish. The mother of pearl buttons are attached with crossed-lock stitch and fine 120-stitch buttonholes prevent fraying of the fabric. The collar band is fused from outside to avoid discomfort to the neck. Each shirt comes with hand-stitched monograms. “We ensure the finest Indian workmanship. You can take the labels off all the major shirt brands in a testing and ours will definitely be a top choice. If you compare a Camessi to a Kiton or a Brioni, we definitely deliver better quality and finesse. When we started out, the standard we set for ourselves was Fray (the Bologna based Italian handmade shirts that are even more expensive than Zegna and Brioni), and over years, we have proved to be more consistent than them. Minor details matter. If the thread breaks while stitching, we take out the broken thread and re-stitch. If the fabric has begun to fray, we discard the piece altogether… perfection, that’s what it is all about,” says Shroff. Camessi produced a hundred shirts in 2009. Today, they produce 2500-3000 shirts a month. But that is a miniscule number compared to what other shirt makers manufacture. But the Shroffs are happy with their niche and exclusive appeal. They do not retail in India because, they say, India is not ready for expensive shirts. The shirts, Shroff says, are bought and branded by some of the big name fashion stores in the world. He wouldn’t reveal their names saying that the stores might not like revealing the fact that their shirts are made by Camessi. The stores, he says, are located at some of the best addresses in the world including Madison Avenue in New York, Worth Avenue in Palm Beach and Banhofstrasse in Zurich. They apparently retail at more than $300 a shirt. 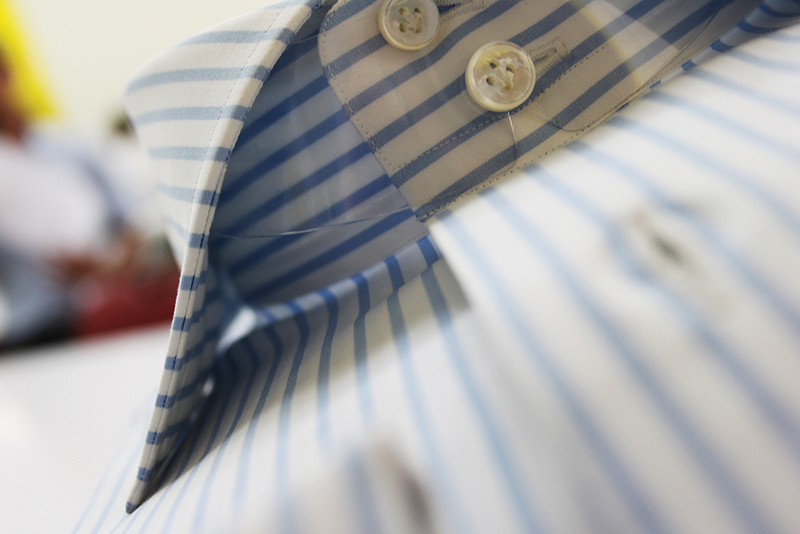 What is available in India though is their bespoke shirt service, which is getting to be quite popular among those who can afford it – prices range from Rs 10,000 all the way up to Rs 35,000. The client gets to choose from over 3,000 fabric swatches and a similar number of design samples which are updated every quarter. A trial shirt is initially provided to confirm the fit and the final shirt is delivered within two weeks. The client’s every demand is taken care of. “We have had to deliver shirts within 48 hours. There have been quirky requests too. While one client wanted an adult diaper stitched to the shirt, another asked for a shirt in pure cashmere. We deliver every single request and ensure 100 per cent satisfaction,” affirms Shroff. Their clients, he says, include top CEOs, industrialists and lawyers. But why don’t we hear much about the brand? “Because those who buy our shirts don’t want to reveal that they are wearing an Indian brand,” says Shroff. “Often I hear them saying that their shirts are Italian made and few of them actually say that they are wearing Camessi. But it is changing now. Word of mouth has become our biggest advertising.” The Shroffs are not looking at becoming a mega brand anyway. Their motto is understated elegance and exclusivity.